Welcome to Hill Lock, a place no one in their right mind would want to be. Vampire Saga: Welcome to Hellock was available as a giveaway on October 11, 2015! Something unnatural is stalking you through an abandoned town! To survive, you'll have to search for clues, gather useful items, and solve clever puzzles. If there's a path that leads out of hell, you'll find it, but only if you take the first step! Welcome to Hill Lock, a place no one in their right mind would want to be. But then again, you're not in your right mind. All you can remember are moments - speeding down twisted back roads on a motorcycle; a spectral figure soaring through the night air; a piercing pain on your neck; and darkness. 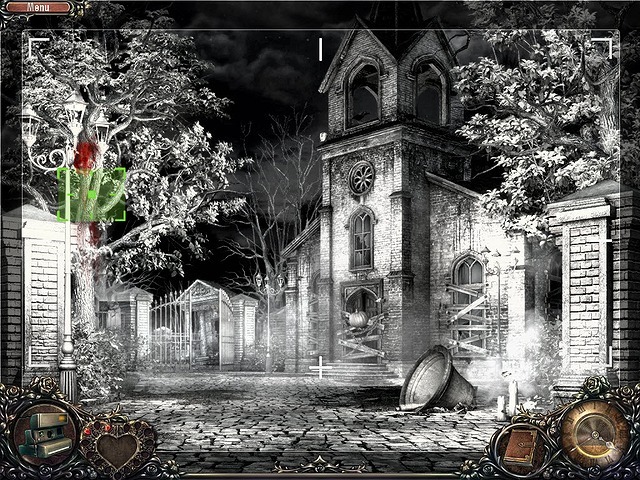 How would you improve Vampire Saga: Welcome to Hellock? Well, I'm back to an "F" grade on this game. I got almost to the end and the game crashed during (I am assuming) the final cut scene. Now I cannot continue because there is nothing to do in any of the scenes and the actions described in the walkthrough I found are unavailable. This seems to be a common problem so I will not waste my time replaying the game. Too bad. Gets a "thumbs" down from me. I was really enjoying this game after giving it an "F" during my original demo of the game. However, when the game crashed and I restarted it, I had only 3 of the 8 rubies I had found. What I discovered was that the restart defaulted to the first profile (my demo). After changing to my current profile, I was back on track. Just thought I would mention it in case anyone else has the same problem. Obviously today the give away has ended. Is there anyway to find where it installed and start the game that "said" it activated? Most giveaways are free standing, which means no or few registry entries. This is why your windows uninstaller doesn't work on most giveaways. Usually game giveaways are either installed to C:\Games\name of game or C:\Program files\name of game, unless it's a Playrix game in wich it is installed to C:\Program files\Playrix entertainement\name of game. Op[en up the folder and locate the games exe file then create a shortcut. Thanks Bob. Since it has expired I can no longer test. However this is not on my end. Seriously. Was working just fine for some time. Only recently can I no longer test the applications. The giveaway no longer starts the packaged installation. And yes I have even added the installer to the exception rules for my firewall and Antivirus. I made further tests on a virtual PC where no firewall or antivirus is present other then the Windows default, and here I get errors like, 'cannot write', 'cannot connect to server' as well as the error I had. I don't doubt that others are not having a problem, however how many are and not saying anything? In any event, I cannot, and will not, give a positive to the author if I cannot install and test. And since the installation failed, I can only give a thumbs down on this. For me, this is 100% giveaway issue that really needs to be fixed. All other applications are working just fine, only the recent giveaways are failing to install, and only recently have I been commenting on this. In regards to the log file, cannot provide this information, I don't see any link in your comments and in the temp folder there are only a few log files, all empty (o bytes). I doubt you'll actually answer this but I'm giving you, and giveaway, the information so that it can be resolved. I'm sorry you've not been able to get this game. There were over 14 000 downloads of this game, with no one else reporting problems with the installer. It almost certainly has to be an issue at your end. Statistically with only yourself reporting this (0.007% of the giveaway population that downloaded this game). it's 99.993% certaintly that it is a fault with your system. If there was a fault with the installer, there would be a significant number of community members unable to install this game and we would have been inundated with complaints that community members were having the same issue as you are having. Your argument about how many are having this problem, but are not saying has no substance to it, because if there was a population of giveaway community members having problems, even if some didn't report the problem (and I'm sure there would have been some) there would still have been some posting about the issue to seek help because they would have wanted the game. You should be able to see log files of any errors/issues via the event viewer. Just type event viewer in the search field and it will open the viewer. From there you should be able to view any error messages that have been recorded. It's advisable to open the event viewer immediately after the event, otherwise it can be quite tedious searching through the error messages. Though, if they are dated with a time stamp it may be easier to find. I do hope you are able to fix the issue. There are other alternative; if you really want these games you could check out the free games sites such as Toomkygames and MyPlaycity (I've linked to the main ones in my review (see comment number 1). They do try to persuade you to install tool bars and change your home page and in some cases your browser, but these are easily avoided by unchecking the check boxes during installation. One of the regular giveaway community members (Diane) has said that Toomkygames doesn't install toolbars etc and is probably the best to go for. Not all giveaways are available from the free games sites, but Sundays was. If you are unsure about installing a game from those sites, perhaps try using your VM first to see how you feel about using their games. They are absolutely safe with respect to malware. When you close one of their games down, it will open your browser to the sites home page. (it's their way of earning revenue as everytime someone visits their site they get income). It's probably the setup.gcd file that you are having issues with. Becasue it's Themida based it has caused a lot of problems for quite a few community members. unfirtunately, the giveaway team were forced into adding the security due to unscrupulous community members, who found out how to hack the giveaway wrapper. This eventually led to some community members posting details of how to hack the wrapper, thus securing a permanant executable that you coulld install at any time. This had consequences for the giveaway team, becasue developers were not happy giving away games only to see them posted on peer to peer sites. Developers started to disappear, so the giveaway team had to take action and incorporate a decent protection memchanism to stop the hackers. This resulted in the themida based code. I think the review you copied was unduly negative -- the graphics are crisp and bright, not muddy at all -- and the story is intriguing enough, so far as I've progressed. The setting is pretty depressing, but I'm hoping for a satisfying ending. Thanks for this one, Alawar and GGOTD, and Whiterabbit for your reviews and moderating. I just got to play the very beginning of the game. It really wasn't enough to say much as far as that goes. I really like Pandora's Box, so I'm sure I'll like this one. I assume they are along the same line. I wanted to thank Alawar and GGOTD for the game today. It is always like Christmas and I really appreciate the chance to play the games. I tried 3 times to install on my wifes computer. Although it says it is activated, I can not find the program. It states in read me file it should be in C:\Games\VampireSagaWelcomeToHellock_Game) that folder does not exist. I did not change installation folder during installation. I tried to install in my computer with the same results. Also tried a search for the program, it does not exist anywhere. Hate I missed this game, seemed cool. The search function won't work becsue the game is ionstalled free standing, which means no registry entries. Try installing to a path you know. i.e. C:\program files\VampireSagaWelcomeToHellock_Game, then go to that path and open the folder to find the games executable to create a shortcut. I now see there WAS a sequel made, in fact there are three to the series, this one is number two. I'll wait for them to appear here because I don't like the toolbars and other garbage that come with games on other sites. Hahaha I agree. Still wondering what it really means. Sequel perhaps? for a while i always get "failed to connect"-screen, when i try to activate a game. turned of my kaspersky but the same result. has anyone an idea, where tp locate the problem??? missed lot of games, i would love to play. Hi Suckie, have you checked the FAQ's thread. I link to it in my comment above (see the problems section comment number 1). Immediately after trying to install open up the event viewer and check the most recent logs. If there is a conflict or other problem, you can usually find a log of it there. Some error messages may seem cryptic, but often small clues can be found, for example if you see the words DX it would indicate your direct X needs updating. Often it's a graphic driver problem, or a conflict with security. Hopefully you will find a fix in the FAQ's thread; it's not extensive list, but there are a few fixes that you could try, including going into compatibility mode and making sure 'Play as Administrator' is checked and maybe trying it on a different operating mode eg XP, Win 7 etc. If you're not sure how to find compatibility mode, right click on the games executable (you can do this via the shortcut to the game) and select properties. When the properties window opens select the compatibility tab. Try various combinations by checking and/or unchecking various parameter to see if you can get the game to work. Hi, since we had Vampire Saga: 'Pandora's Box' gave away here back in April - after completing it I went to check if there was more, and indeed there was already a 'trilogy' of them out there. Next came Today's Giveaway: V.S: 'Welcome tho Hell Lock', followed by V.S: 'Break Out'. I got Hell Lock and Break Out from MyPlayCity, but downloaded Today's Game from here nevertheless, as I prefer clean download without watching any boxes to untick either when installing, or starting a Game from M.P.C's Console. Really good set of Games these Sagas are - if one likes HOGs and a bit of atmospheric, 'dark & gory' Story line (never to be taken too seriously mind:), especially at this time of a year leading to Halloween.. I like graphics enough (nice HOs), but strangely enough find some scenes bit 'rough round the edges', perhaps because the concept of mixing realistic and cartoony doesn't work well in this instance? Just my impression.., well, only yesterday I completed playing 'Nearwood', main and bonus play, so I'm bound to be spoiled by enchanting (and consistent) graphic feast!:).. Thanks very much GGOTD for Today's Gift, Stephen for hard grafting and moderating and above all (in recent times) for..continuity of this fine Site in keeping things as they are, where they are, where they make make perfect sense, where one can find and check Archives still on page(!) - with ease, interest and pleasure, where one can read, learn, being able to concentrate on essence and value of Comments, and when time allows - wanting to participate and leave own feedback in return. game is most excellent. I love the way they treat HOG format with the highlights in Casual (didn't try Expert). Other little bits make it decent to play. The objects are really nice. Whole thing has a comic book flair to it. Much fun keeper. 9/10 for me. Thanks for a great Fall season play. Glad you liked it. Was dubious about posting the negative reviews, but didn't have the time to review the game properly myself. Agree about the comic book look. From your description of the problem it sounds like it's most likely a false positive detection by your anti-virus program, which is blocking execution of the setup.exe program. Check way back up at the top of Comment #1 for an explanation of the problem and suggested workarounds. This has been happening to a lot of people recently and it's usually a fairly simple fix to get the installation running correctly. What more can I say than everybody else. I love the game and the story line but it's much too easy. Well, I was a little skeptical due to the bad reviews, but I don't find the game so bad, at least not so far. I think I'd recommend it for people with mild visual disabilities because it is so helpful, and the visuals are clear enough to see what's there. The repetition mentioned in other reviews might actually make it fun for people with memory problems too, who might not normally gravitate to HOG style games. So far, it looks a bit like a ghost story rather than a vampire, but I'm only a little ways into the game and haven't seen anything odd yet other than strange shadows. Installation was normal and I was able to switch off the custom cursor, which I like. It won't play in windowed mode unless you have a high enough resolution to support it. I think this game deserves a bit more respect than it is getting. Thank you for your feedback Therese. I agree that it would be ideal for visually impaired community members. I was sceptical of posting the negative reviews, unfortunately I wasn't able to find any lengthy positive ones which lead me to believe that it may have been a poor game, tohugh my initial feelings after playing it for 20 minutes was a little more positive. I did try to give a positive slant to it in my brief intro' before the two reviews. Just a pity that the owners have not been letting me get copies of the games for the past several months. I used to get a copy of each game a few days before they went live so that i could review them before they went live. Now I'm struggling to give the games justice as by the time I've finished playing the game and written a full review several hours have passed. Most visitors download in the first quarter of the giveaway, so i always feel it a waste of my time working on the day of the giveaway. I've been really busy for the past few weekends due to bad tenants so haven't had the time to play the games before posting reviews. Please check the FAQ's thread over in the game discussion forums. You'll find a link in the problems section in my comment above. (See comment number 1). I'm sure you'll find a fix for whatever the problem was? See my reply on comment 3 above, about the Properties box and checking the box for “Disable display scaling on high DPI settings.” This is all I had to do. I also have Windows 10 64 bit system. See my reply on comment 3 above, about the Properties box and checking the box for “Disable display scaling on high DPI settings.” This is all I had to do. I also have Windows 10 64 bit system. Thank you, thank you, thank you! For the tip about clicking on the Properties and Compatibility mode, to fix compatibility issues. My issue was that the display was too big for my monitor screen, cutting off about 1/3rd of the screen. Checking the box for "Disable display scaling on high DPI settings" fixed my issue. You have no idea how many games I abandoned because of this issue. Windows 10 64bit. Downloaded fast and installed easily after I disabled Tencent PC Manager. Plays easily. Sorry -- my last statement got changed. I didn't mean to try to use html but it thought my use of gamename (within brackets) with the last line as html. The default exe for ToomkyGames is the game's name.exe. Just change that to "game.exe" to avoid the browser opening. One of the reasons games from free sites open your browser once you close the game down is because it gives the site earnings. Everytime you visit their site they earn a little through advertising; (more if you actually open an advert), but with thousands of visitors every day, those little trickles of earnings do mount up. They use the majority of those earnings to pay the developers of all of the games they are giving away for free. I've been told they pay a specific amout each year to each developer to be able to continue to give the games away. If everyone stopped the browser opening, it would cut the income from advertising drastically and would reduce the number of games the site could offer for free. For those interested - This is the 2nd of 3 Vampire Saga games. The first one was already offered here. The three are: Pandora's Box, Welcome to Hell Lock, and Breakout. All three are available at both MyPlayCity and ToomkyGames. I would recommend ToomkyGames because there is less "garbage" with the install and both have the ability (if you know how) to avoid the opening of the browser. ToomkyGames is cleaner (no attempt to hijack anything) and gives you the opportunity to put the game where you want! With MyPlayCity, there are 16 or 17 files plus one folder that is just flat garbage that can be removed (about 5 MB/game). With ToomkyGames, it's one or 2 files. Just change the shortcut with ToomkyGames to start game.exe instead of .exe and no browser opening! Still not got ToomkyGames on my personal radar, which is why I don't check to see if there are any games at the moment. I don't usually get games from any the free sites any more as I personally prefer to buy the games (I feel like I'm supporting the developer a little, besides, I can afford them). This game requires A LOT of soak and elbow grease! How worthless can a HOG be if the HOG tells you where all the HO are H? I'm afraid this game was a total disaster for me. I've always loved Alawar games, but this one wouldn't work. I tried playing as Administrator and changing the compatibility to Windows 7. I have a Win10 64 bit system. I could get the executive file to open the game. However the introductory sequence and the title page was off-centre so I could only see 75 percent of them. When I clicked on anything other than 'play' or 'exit' on the Main Menu, the game would crash. After clicking on 'play', however, there was little joy. An opening screen showed with lots of insects flying over it, but there were no directional arrows or any interaction on the screen that I could see. AS the game took about two hours to download, it's a little anti-climatic. Thanks, anyway, GAOTD, for a great resource. I love the opportunity to play free games and most of them work totally fine. Update on my last comment: contrary to the rest of the gameplay, with regards to the generator in the mine entrance, they allow the cogs to be placed incorrectly!!! Doh!! How inconsistent! As soon as I tried with the cogs switched, the generator chugged into life!! Aaghhh! I have gotten as far as the mine entrance, where you have to attach all the cogs, fan belt and whatnots onto the generator, and once you've done so, you then receive the message that you believe you can start it now by pulling the lever, which the sparkles indicate as well, but no matter how many times I try, after having tried to chugg itself into action, all the parts fall off again and I have to start over!! The inventory belt is not active, so it's not as if I can try attaching anything else from there, and the whole frame is inactive except for the start lever!! Aaghhh!!! I've downloaded it twice. Both times, the game shut down before I started playing, when I clicked 'options' in order to soften the volume of the music. It looks like an old creepy-horror themed game, so I will not be trying a third time. Extract all the files from the zip file. Run the setup.exe and get a message saying Activating that closes after a minute or so, then nothing. I waited about 10 minutes and even retried several times. I can see in the Windows Task Manager that two setup.exe programs are running, one is in the folder I extracted the zip file to, one is in the Windows temp folder. Ending the setup.exe process tree from the location where I extracted the zip file, closes both setup.exe programs from the task manager. Ending only the setup.exe from the Windows temp folder results in the wrapper showing again and opening the giveaway site. Nothing more, and I did check for hidden files. Appears the Giveaway installer isn't working correctly since the downloaded content is much larger then the content it is running to install? If this is an error with the giveaway installer this is very unfair to the supplier, if the supplier is at fault, they need to update the installer as it looks like the giveaway installer is failing. Please repair and I can only give a thumbs down on this if the installer is failing to function correctly. Thank you for your detailed message, however, it's not the giveaway installer that is the problem. Nearly 5000 copies of this giveaway have already been downloaded. If there was a problem with the installer, we would have been inundated with messages from the community. It has to be something at your end that is causding the problem. Please check the FAQ's thread over in the game discussion foirums. i've linked to it in my comment above. (see comment number 1). Check your event log to see if there are any logs related to the giveaway installation. It may be a program you are running in the background is interfering with the installation, for example, your security. Please read the first couple of paragraphs i've written in my comment above, which expalains about the Themida protection that the giveaway is packaged with, and its effect on some community members attempts at trying to install. Thanks Chewy, obviously a spelling error, nicely spotted. :) Deleted as requested. ........................Moderator comment............................ Thanks Chewy, obviously a spelling error, nicely spotted. :) Deleted as requested. Keeps crashing on the sign in screen. I've had problems before with other games, all I had to do was change the option for the windowed mode vs the full screen mode. I can't get there because of the crashing. I get this error while installing this game: "The archive is either in unknown format or damaged". After that nothing is installed. For those of you who are getting hits by your anti malware suites, firstly it will be a false positive; the reason you may be getting a hit is because your anti-malware suite is picking up the Themida based protection, which was put in place to protect the game from unscrupulous community members that were hacking the giveaway wrapper which then gave them unlimited access to a registered copy of the game, and which was being put on peer to peer sites. Some community members were even uploading video tutorials on You Tube telling you how to do it yourself. Themida based applications are sometimes seen as a threat by anti-malware. I can assure you this game and hundreds before, that have given community members cause for concern have been totally safe. The game giveaway team have managed to secure well over a thousand games for us since they first started giving games away back in late 2006 (firstly via the main site back in Oct 2006, then via the game giveaway site early December 2006). There has never been an infected game given away. If you are able to configure your anti-malware suite to allow the 'offending' file through security, the game should then install normally. If you can't, or don't know how to, then the other way would be to temporarily turn off your protection. You do so at your own risk, but please do take into account what I've already said above; in a nut shell, every malware occurance reported here since the game giveaway went live in Dec 2006 have been false positives due to overly sensitive anti-malware suites. It would be against the teams best interest to allow such an occurance as it would destroy their good standing with the big search engines and I'm sure many who have frequented this site for a long time would leave. The giveaway team use several antimalware suites to test every game given away here. Another thing to consider when you think the game is infected, if it really was, there would be hundreds of community members posting about the infection; we rarely see more than a few posts for any particular game. Since the gcd file was introduced over the summer of 2012 I have seen many more community members reporting infections due to the Themida based code found in the giveaways wrapper protection. However, out of the thousands of downloads each week, those community members reporting a malware hit are considered insignificant and support the fact that the results they are getting are actually false positives. They have always been proven to be so. The following two reviews were not written by me. I've posted them because I've not had time to play the game enough to write a full review. I've taken 20 or so screen captures and played through the initial part of the game. I don't particularily agree with what either of the two reviwers say about this game. both are quite negative about virtually every aspect of the game. 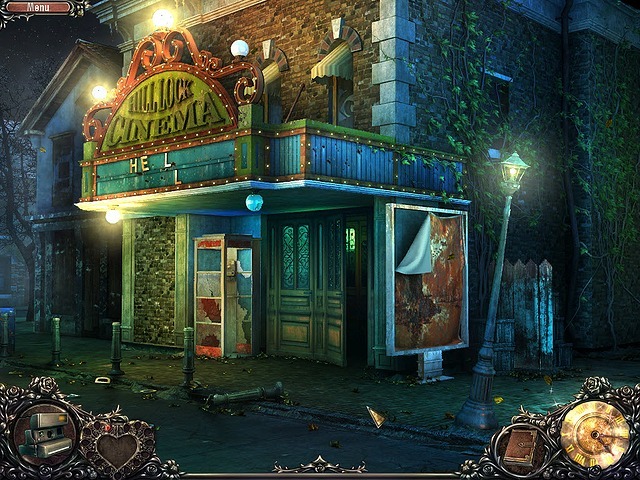 I don't particularily enjoy Hidden Object games these days unless they are exceptional; todays offering is really just an average hidden object game with a slightly different way of navigating through the various locations using photography as a tool. The graphics are decent and the overall presentation is good. The only issue I really had with this game was in expert mode; the list of words telling you what hidden objects were to be found still glowed when you were near them, making this a very easy expert mode as there really was no hidden objects because of the prompting. Overall I still think this is worth downloading, especially if you like hidden object games and if you have young children that aren't bothered by the dark atmosphere, or if you usually have difficulty finding objects due to deteriorating eye sight etc. When you first start a new game you will be asked if you want to learn how to play. If you choose yes, you will get the usual tutorial messages until its deemed you've got the basics. Useful information is recorded in the journal, which is located in the bottom right hand corner of the game play area. In casual mode useful objects that you need to collect will be highlighted with a white/vaguley yellowish glow with starbursts. Hidden objects are the easiest items to find i've ever seen in a HOG, simply becasue when your cursor is near or on the object the word related to the object changes color to green. The collision mesh for this 'cheat' is quite large, so it's easy to pick up objects simply by slowly waving your cursor around the scene. If that doesn’t sound like much fun to you, there’s a pretty good reason. It’s not. Vampire Saga: Welcome to Hell Lock is an all-around disappointment in pretty much every way. The graphics and music are unremarkable, the story is nonsense (even for a hidden object game) and worst of all, it’s just dull and uninteresting. Even the connection to vampires is tenuous at best; I’m no fan of sullen, angsty undead hipsters but at least they show up in their games. And when a game is bad enough to make you feel a twinge of nostalgia for that sort of faux-Twilight drivel, well, there’s only one way to put it: it/s rubbish. You can see several videos of game play HERE and HERE. You can't change the in game music only turn it off via the options. 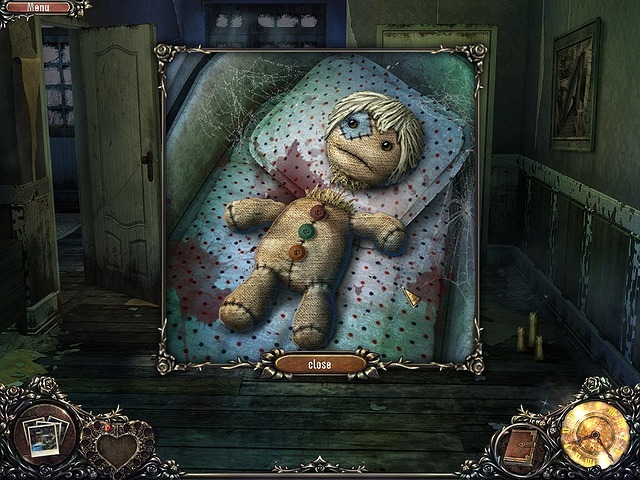 Hidden object parts of the game were far too easy due to the highligting of text that appeared when your mouse was close to the object. The collison mesh is quite extensive, so your mouse doesn't need to be right on the object for the word associated with that object to start glowing, what's worse is that it also happens in expert mode. apart from this I found the initial part of the game quite enjoyable. I can't comment further unless I get more time to play the game today. We are very busy preparing one of our houses for a new tenant. The previous tenant casued well over £3000 worth of damage. I've not played the game long enought to give a meanigful score. It’s always worth checking out the free games sites because sometimes the games we get here are also available for free from them. MyPlayCity (MPC) has the most with over 1000 games to choose from. There are 372 games on sale over on Steam this week, ranging from 10% to 90% off. The weekend deals include up to 75% off the Telltale games catalogue Walking Dead seasons I & II, Tales from the Borderlands, The Wolf Among Us, Game of Thrones, The Walking Dead: 400 Days, Back to the future: The Game, Night 2, plus loads more. There's also 40% of Darkest Dungeon, and 66% off Depth. There are too many other great deals to mention here, just check out the specials section for all 650 plus titles on sale HERE. • Use the environment to your advantage to overcome the infernal traps, puzzles and machinery of the prison. You get a double pack. Grab a friend, grab a gadget, grab a gun and get ready. Space Farmers is the most fun you'll ever have in a co-op game. Pay £0.99 for the double pack or you can get two packs if you pay more than the average of $1.00 (at the time of writing ). One Steam key to share with a friend or family member perhaps? You'll find that deal HERE. They also have five bundles of several games that'll cost you less than $1.50 each HERE (DIG Bundles 40, 41 42 & 43 a Topware bundle). You get Steam keys for all of these games.